There’s one problem with the popularity of plastic-extruding 3D printers such as the RepRap and Makerbot; since they’ve become so popular, the price of plastic filament has skyrocketed over the past few years. Without a way to produce filament at a hackerspace or home lab, the price of 3D printed objects will remain fairly high. Project Spaghetti hopes to rectify that by building a machine to make plastic filament for 3D printers. The folks behind Project Spaghetti – a loose amalgamation of makers going under the title of Open Source Printing, LLC – have successfully built a machine that is able to produce short lengths of plastic filament. Early machines used a plunger to press small pellets of ABS plastic through a heated steel pipe to produce filament. There are a few problems with this approach, especially when the temperature is set to 480F, but the team was able to make a bit of filament with this design. Although the team is using a piston to force melted plastic out of a nozzle, they do have a screw-drive ‘plan B’ in the works. This design should allow for continuous extrusion for theoretically endless reels of plastic filament, every RepRappers dream and a neat way to win 40 grand. boy are they gonna be in for a surprise. All modern injection machines use a screw compression method, problem is, that several tons of force can build up inside the screw mechanism, then you need a heater, because once it is filled with plastic and when you shut it down, you have to re-melt the plastic to start it up again. Yes, the extrusion barrels I worked with were rated up to 500,000 pounds of dynamic force. If the operator shut the machine down without turning off the heat, the plastic could break down into high pressure gas and cause a violent explosion too. Fun stuff. Well, I always wanted to do this in my garage, but the energy costs are very large. The smallest extruders we had still used more power than a typical residential line could handle. I would love to see this done and available at low cost. You bring up an important point. It is nice to be able to recycle your own plastic instead of putting it out in the recycle bin for someone else to do it with your free material, but what are the energy costs in producing the filament out of this plastic? I’m all for not giving my plastic for free to a company and to recycle and use it myself, but does it really pay in terms of electricity? There’s a problem with using a screw (and believe me, I know). I’ve tried my hand at making a small filament making machine and making the screw is exceptionally hard. here’s a pic of my screw, which has yet to be produced. I talked to a few machinist friends and they’re quoting me $1000 to make this screw. These are friends, mind you. Actual screws for industrial use cost around $5 – 10k. The plunger design might be the best option for an open source filament production station, because otherwise the means of making your own filament will remain the domain of people with gigantic and expensive machine shops. 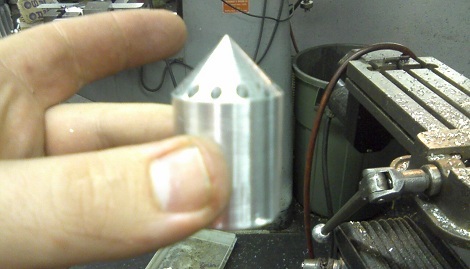 If you have a five axis mill (or can otherwise make that screw), send me an email. I know I can’t do it. You could 3d print that screw in plastic then cast it using lost wax method. It would cost way less than the prices you quote. Zee, would cast metal be strong enough? I ask as it seems you see this kind of thing worked from a larger piece instead of cast, there must be a reason. Call me Shirley, but wouldn’t a metal lathe be a much simpler solution? Though I guess I can’t say if the threading features of modern non-specialized lathes can handle that pitch..
To make your oh so complex $1000 auger screw that requires a 5 axis cnc mill, all you need is a $500 mini lathe, a live center for the tailstock, and a cutter ground to your thread form. Set the tailstock up to cut a taper and cut the thread as you would any thread using the leadscrew. Not very hard, is it? Any machine shop could crank that basic design out in 10 minutes. You may have to make some design allowances in the way of pitch and thread form. That’s a 4-axis part, which simplifies things greatly. It COULD be done on a lathe with a spindle encoder, but if you have access to that, it’s probably no big deal already. My 4-axis Taig would do it much cheaper than that, but I’m lazy. Hojo: You’re right, I’ve never cut a tapered screw like this on a mini lathe. I have however cut tapered things and threaded things on my mid size lathe. I think its safe to assume I can do both at the same time. I have a manual lathe and a CNC BF20. Its fun to work the traditional ways on the lathe and the new ways on the mill. Keeps things fun by working at both ends of the spectrum. Tailstocks always have an adjustment for side to side built in. If you offset the tailstock and use a live (or dead) center, you can cut a taper. If he wanted to, he could engage the lead screw instead of the feed screw and cut a tapered thread. If he used a different tool the thread could be a knuckle shape or whatever you want. You don’t need a spindle encoder, CNC, 4th axis, or any of that. At minimum you need a lathe (such as a $500 mini lathe), a pair of dead centers (I assume the mini lathe comes with a set), a drive dog (for all intents could be two pieces of wood and some wood screws), and a cutter ground to what profile you desire. Its really a simple part. You could definitely make this on a mill with a 4th axis, a 5th axis, or a CNC lathe with a spindle encoder. You can also make it on a manual lathe and I would argue a one-off could be done much quicker on the manual lathe. Hi: I was just reading because of my interest in the Reprap and getting filament at a fair price. I soon realized that the cost of filament would make some of my parts out of line. I am a retired macinist ( young 66 with wife half that) and still have a few machines to tinker with. Matsuura machining center and three lathes,one is CNC. Cutting the screw you show in the pic, would be no problen for the CNC with thru spindle capacity of 1.625 or the larger conventional with 3.00 bar capacity. I think the larger machine will cut 1-1/2 threads per inch which is .666 pitch and the CNC should do the same or maybe even 1.00 pitch. Just pretend you are cutting a tapered thread on a straight bar. Cutting a tapered thread on the CNC just adds one word in the G76 execution line. Let me know if if I can help. I would need to know the OD and length of the part. I was thinking of building one of these with a small hydraulic pump pulling a much larger displacement hydraulic motor to get the required torque and speed reduction plus easy control of pressure with an adjustable relief valve. I would also use an adjustable flow valve to control the speed. A hydraulic motor is used on the screw of almost all sizes of injection molding machines. I used to maintain extrusion equipment and plastic production lines. 480F seems rather high, unless working with Nylon. The ideal temperature was when the plastic was extremely viscous like tar and extreme pressures were used. For unleaded plastics, if it burned in 5 minutes, the temperature was too high. Leaded plastics with antimony trioxide were completely resistant to heat, but you didn’t want to breathe the fumes. The guy’s at Makibox working on “Pellet-Drive”. This produces the needed filament inside the machine. No preproduction needed, just fill the pellets in the box. Hmmmm. So I guess my plan to make some in the kitchen with a hand wound spaghetti machine and a blowtorch are probably not going to cut it then? The pellet systems are very interesting, but I can’t help feeling like the prices of filament are only high for the short-term. There is high demand and people are paying high prices, that will bring other companies into the mix. Unless there is massive price-fixing, the price will drop a lot. weed-trimmer line? $3.69 for 50 feet…But i do like the idea of home filament production. It has been explored, seen a few people who have done it. The nylon used in weed trimmer line produces awesome flexible items, however there is a catch: the trim line needs to be baked in an oven to remove as much moisture as possible. Then you need to store it in an airtight container and only cut off trim as needed for the machine. Uhm…. Is everyone forgetting about the Filabot? http://filabot.com/ – The dude’s already open sourced his plans on Thingiverse.com – you can build one if you’re brave enough. It looks great in concept, but their plan to build and sell them out of a box truck in their college parking lot seems kind of iffy to me. He’s working on the project while in college in a mobile laboratory, I doubt he’ll be selling the final product from the back of a van. Would you rather watch the development cease for a whole school year until he comes back home for summer vacation? I got in on the kickstarter for that one a while ago. still waiting for it to ship but he had been pretty good about keeping people updated. It seems like it’ll work but it’s probably not the most efficient process for it, took about 8 hours to make a 1kg spool, so you won’t be running a factory with it but for recycling stuff at home it’s probably not going to be much of a problem. Its not hard to make at all, just use a variant on PCB etching. I came up with a method which simply requires a metal rod (copper, aluminium, etc) and a spray can full of PCB photoresist. Spin the rod up to about 500rpm and spray it with photoresist, then allow to dry in the dark. Once dry, pre-expose to deform the resist then use a modified optical drive with Bluray burner laser and Aixiz module preset to the surface and a 0.07mm focal spot. Simply rotate the rod using a PLL synchronised to the microstepper and a slowly decreasing step interval. Then develop your rod, etch in persulphate etc and if needed anodise with boric acid. I prefer to use a main winding of the normal lotus o-deltoid type placed in panendermic semiboloid slots of the stator, every seventh conductor being connected by a non-reversible tremi-pipe to the differential girdlespring on the ‘up’ end of the grammeters. I find this is the only way to prevent side fumbling of the ambifacient lunar wane shaft. Ebay has many plastic extruders with detailed descriptions. They will recycle an enormous amount of plastic over time. Unfortunately, most of them are the large ones (like what I worked with.) They are going for several thousand dollars and up for the “small” ones. For the heaters, it is possible to retrofit with natural gas although I haven’t seen it done. That would leave power requirements for the motor drive, which requires significant horsepower. If anyone does get one of these, be aware of the safety issues when dealing with high pressure/temperature plastics. Hot plastic melts through human skin and has to be surgically removed. If you want to cut your own variable lead and/or depth plastic extrusion auger, look up electronic leadscrew. That’s a way to control the thread pitch a lathe cuts without using change gears. Combined with computer control of the cross slide it’s possible to cut all kinds of shapes on a lathe. Even better, all the info to DIY this on small lathes is freely available. I know nothing about this and so this is probably extremely dumb but could you not get over the problem of continual feed by having two (or more) piston driven hoppers that feed into the pressurised extruder tube? Sort of in a ‘Y’ shape. You can feed the cylinders alternately with pellets switching over from the one you are filling to the other one that you have finished filling and is already driving to provide the pressure. Obviously you would have to ensure that you match the pressure of the main cylinder to the one of the one you are switching to before flipping the valve over. Sorry for not explaining this very well but I hope you get my drift. That would require a valve, which would just get gummed up with hot molten plastic, and stop working. The reason a piston system will never work is that you need an avenue for gas to escape as the plastic is compressed. An auger is best in this situation as it allows gas to escape back out of the flutes of the screw. Why this project is challenging is because you need to drive a very viscous fluid with very high pressure. To achieve any sort of reasonable extrusion speed you need a massive amount of energy in. Heating is only like 10% of this energy. In fact, you will get most of your heating from shear friction in the plastic as you are pressurizing it. My side project on HackADay! Umm – you’re suggesting a method of making a varying pitch extrusion auger, yeah? I can see how that might work for an etch depth of perhaps 1-2mm, but wouldn’t (ragged) undercutting be an issue after that? – surely typical required depth of (clean) cut is order of magnitude greater? I know very little about this but would it be possible to use weed-eater string? It has to be a special sort of plastic, with the correct softeners and tensile strength and melting point. I did look into using UV light and a cheap optical mouse (ADNS series) sensor to examine fibre and alert the user if it was about to become tangled. @gmcurrie Yes, also it is feasible to do multiple depths simply by exposing it in sections to the etchant in order to get a variable depth AND pitch. – wonder if chemically etching a baseplate as seen here might be within an adventurous hobbyist’s scope?? It works and be has YouTube videos. I currently making a version of it.